Today, June 10, marks the 25th anniversary of the beginning of the 1992 European Championship. While my first footballing memories are linked to Italia 90, beyond Ireland’s games I wasn’t too aware of what what was happening at the time. As such, Euro 92 was the first tournament I properly experienced. It was the first major finals to feature names on shirts and frontal numbers, but in other ways it now seems very anachronistic, making it worthy of our attention. Having only eight teams taking part seems incredibly quaint, considering there were 24 at Euro 2016. On the kit front, superfluous sleeve patches had yet to muscle their way in, while special inscriptions to mark the event made their first appearance but were only utilised by a few countries. Only two – England and Scotland – had their crests on their shorts. Perhaps most surprisingly, of 15 games player, only three saw a side use its second kit. Shorts clashes were tolerated and, barring one exception, the dark-v-dark wasn’t deemed a clash. Group 1 saw hosts Sweden joined by eventual winners Denmark, France and England. Both Sweden and France had adidas kits – they made the strips for four of the eight sides and were pushing a new aggressive branding. Well, we say ‘new’ but this look was familiar to English fans, as Liverpool had had it since the start of the previous season. Sweden also had a different font to the other three adidas sides. 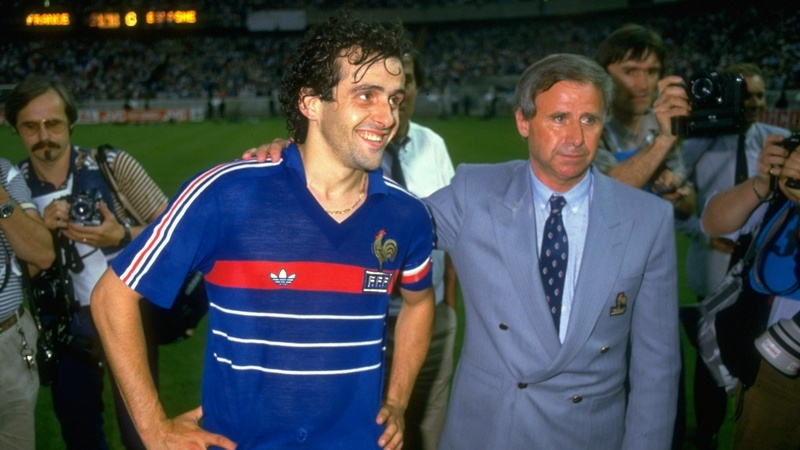 France were wearing a look which hadn’t been seen before, with the thick three stripes coming over both shoulders. This meant, rather unusually, two red stripes with one white in the middle, rather than three white stripes with blue and red in between. As they would do in winning the World Cup on home soil in 1998, France had indvidual match details on the crest. The shoulder stripes were not designed with names in mind – this looked even worse on the away, not seen at the Euros but worn in a warm-up friendly against Switzerland. France also played the Netherlands in a friendly on June 5, five days before the tournament started – something unthinkable nowadays. Denmark were a late addition to the competition, invited instead of Yugoslavia due to the Balkans War. They would go on to win it, and would end up being the only side to wear a change kit twice. The kit was classic early 90s fare, with very long shorts, and plenty of design elements – Hummel recently launched a tribute kit and felt that they had to calm it down somewhat. It wasn’t bad but suffered in that it didn’t live up to its 1986 predecessor – the 1988-90 kit was pretty cool too. As well as the penalty shootout semi-final win over the Netherlands, the Danes also changed against France – presumably the sock clash played a big issue, though France in blue-white-white and Denmark in all-red would have been a more sensible solution. The other side in Group 1 were England. Oddly, though, they wore the same kit as they had had at World Cup 90, apart from the addition of the shirt numbers, the ‘Euro 92 Sweden’ inscription below the crest and the Umbro wordmark now being in caps. It seems likely that this kit’s record of being worn at two major finals won’t be equalled in the foreseeable future. The Netherlands were unbeaten as they topped Group 2. Having had adidas since the late 1970s, they switched to Lotto after the 1990 World Cup and the Italian maker kept largely to the same theme during the six-year partnership. Their main change was to add the colours of the Dutch flag to the collar, while the Lotto logo was repeated throughout in a darker shade of orange. Germany came close to repeating the West Germany feat of 1972/74 and holding the world and European titles at the same time, only to fall to Denmark in the final. The big problem for adidas was trying to improve upon perfection. Mercifully, they didn’t go overboard with the Germany kit, nodding to the previous ribbon but confining the coloured bars to the sleeves – the same design would be used by Arsenal – while the neck featured subtle DFB (German FA) logos. Scotland were also in Umbro, but again it was a kit which wasn’t new. This had been launched at the beginning of 1991-92, when Umbro’s big motif was esoteric geometric shapes. The collar insert was very obtrusive and, while red socks look well on Scotland, confining the colour to the tops of the socks made them look like a borrowed pair. As with England, Scotland had a different number font on their shorts. Incidentally, their squad numbering was determined by how many caps each player had, so the number 5 was worn by centre-forward Ally McCoist. But for a 90th-minute Thomas Häßler free kick, the CIS would have begun with a win. Instead, they bowed out with just two points, drawing with the Netherlands and then losing 3-0 to Scotland. Having qualified as the USSR, the break-up of the union meant that, for the finals, they were known as the Commonwealth of Independent States and so it wasn’t worth anybody’s time to create a crest. Beginning with the 1994 World Cup qualifiers, each nation would compete under their own steam. The CIS had the same style as France – the home shorts and socks were exactly the same – with the away kit worn against the Netherlands. As mentioned above, Denmark were only there as they had finished second to Yugoslavia in the qualifying. 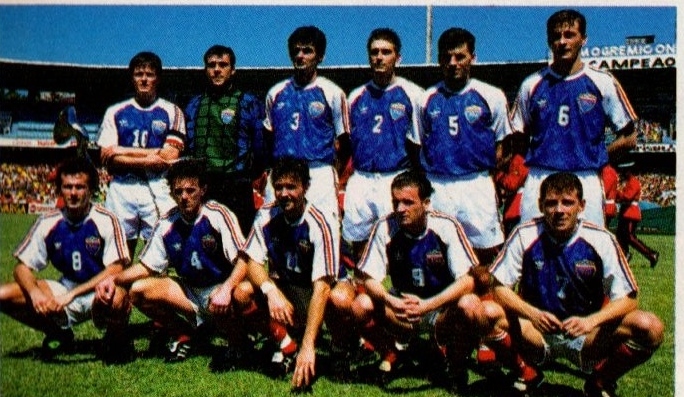 In their final game as a unified entity, a friendly against the Netherlands in March of 1992, Yugoslavia had worn the same kit as they had had at Italia 90. For Euro 92, adidas were set to give them a new kit, but oddly, rather than anything from the adidas Equipment line, it was to be the same design as Arsenal’s 1990-92 strip. As you can see in this Bourne Sports catalogue, preserved by Scots Footy Cards, the neck is shown as blue, but each of other countries’ kits has an error too – Germany and Sweden crests wrongly placed, trim on France neck and USSR crest on CIS – so it’s safe to class them all as prototypes. When Yugoslavia – effectively Serbia & Montenegro, following the break-up of the federal state – returned to the international fold in 1994, they still had this Arsenalesque kit, albeit with a new crest, keeping it until 1996 – surely the trefoil’s last appearance on a proper strip. I do recall seeing that Yugoslavia kit that didn’t get an outing, but did wonder how come their kit was basically a two year old Arsenal kit recoloured and with the “old” (trefoil) adidas logo, rather than the new (Equipment) logo. Also here’s another interesting snippet… the Dutch kit made by Lotto worn in Euro 92, and the one worn in World Cup 1994 are almost identical. 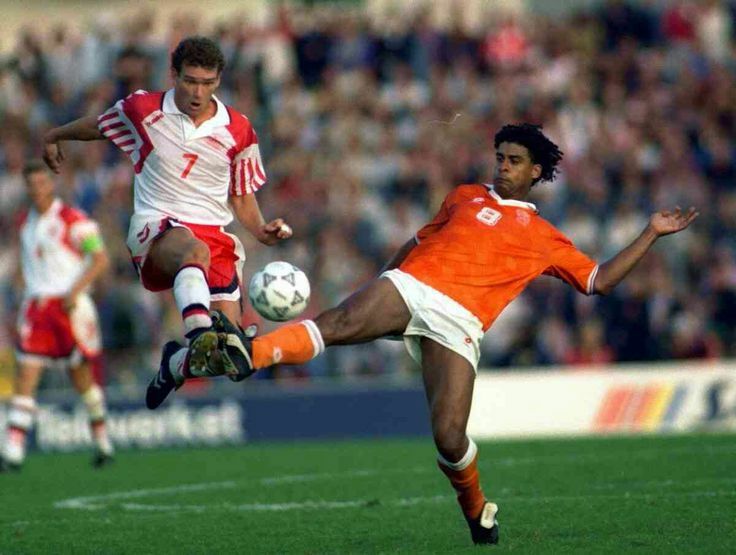 I’d even guess the shorts and socks were the same for the entire 5 year period that the KNVB had with Lotto, from 1991 to 1996, when a new home kit with a different collar and a radically different away kit, were used in Euro 96. Cheers Jon, will amend the Danish away – I was duped by a fake! I linked to the other Dutch kits above – one other nice addition for 94 was the flag trim on the cuffs! Ahh yes, I never really noticed the Dutch tricolour on the cuffs of the 1994 shirt, thanks for pointing that one out. Lotto made some good kits in the 90’s, and some where the designers went a bit crazy (the Wales third kit of 1996/97 springs to mind! )… and the goalkeeper outfits were rather loud. Though come the 2000’s they seemed to be more restrained in design but did start a somewhat annoying trend that almost all of the Italian manufacturers seem to be guilty of – large brand logos on the sleeves. Does anyone know whether Sweden ever wore their blue away kit (even outside of Euro 1992)? Trying to find out if it was a shirt produced but never worn. I went on that same quest, Ross – I couldn’t find any evidence. They played Colombia in a friendly in Miami in February 94 but wore their home. Sweden did wear their blue away kit, with blue shorts and socks, against Australia in early 1992. Correction – the picture I posted above was actually when Sweden played Australia in the 1992 Olympic Games football event, in the quarter finals. Australia wore adidas kits as they were the supplier of their Olympic committee’s team outfits, but were still wearing the outlandish Kingroo kits at full international level until adidas actually took over some time in 1993. The Sweden kit in the picture actually has the Svenska Fotbollförbundet logo in the middle. Back then most teams in Olympic football competition wore the same kit as the national teams in FIFA competition, though Australia (and also gold medal winners Spain) were exceptions. These days teams tend to wear the same kit but with the country’s IOC logo or a flag replacing the national football association’s badge. By the way, Sweden and Australia actually met in a series of friendly matches in early 1992, but for those I would guess the Australian team wore the Kingroo kits. some times, these days, even in 1992, the teams also wore the kits made by the same countries’ IOC suppliers. Thanks. It also looks like they wore the away kit against Paraguay at the Olympic Games too. I just found on eBay the Yugoslavia shirt as you predicted, feel it has some rarity value so at 65 quid I thought it was rude not to!